You know men. Never satisfied with the purpose an item was created for, they must always search for new uses. Take the automobile for example. Here was this perfectly good mode of ground transportation but it wasn’t long before man wanted to make it do two more things. They wanted to see if they could make it float and they wanted to make it fly. Flying and floating automobiles have an interesting history that goes on to this day. Let’s take a look. The first attempt at a regular size floating car was in 1917. Seattle’s William Mazzei produced a car-boat that he called the Hydrometer. The vehicle was propelled by an engine produced by carmaker Continental. It wasn’t until World War II, however, that amphibious vehicles were really put into service. Germany debuted the Schwimmwagen, and soon both sides had vehicles that could travel on land and in water. Today, some of these vehicles are still be found in service giving “Duck Tours” in cities across the country. As far as a personal automobile that could also be used as a boat? Mass production of such a vehicle didn’t take place until 1961 when Hans Trippel produced his Amphicar. 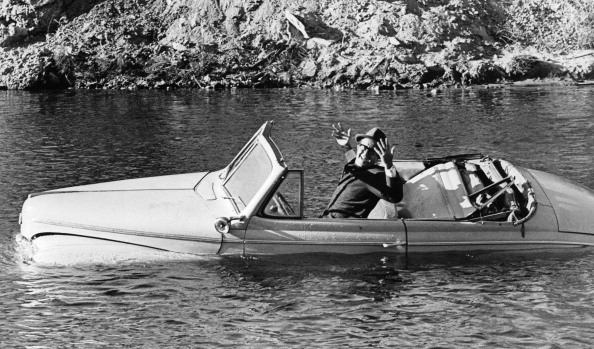 The Amphicar was a sporty convertible that could drive right into a lake or river and continue on about its business. About 4,000 of the vehicles were produced in the seven year run of the Amphicar, and there are still collectable models out there. Today, man continues to search for the perfect amphibious automobile, although today’s efforts are mainly recreational based ATV cross-breed type vehicles. It seems simple enough. If you can get a car going fast enough, why not throw some wings on it and have it take off? Well, it’s a wee bit more complicated than that. There’s the little problem of keeping it in the air and landing it safely. Flying cars have been popular in movies from Back to the Future to The Fifth Element, but engineering problems have always made it impractical. That doesn’t stop companies from continuing to try however. Just last September a Slovak designer-engineer by the name of Stefan Klein flew his sleek looking machine on its first flight. He has been working on his Aeromobil plan since the early ‘90s. His vehicle has smooth lines, looks a bit like a motorcycle-automobile hybid, and apparently can fit in a normal size garage. Klein doesn’t see mass production in the future of the vehicle, but it could have its place in regions that have few roads. Of course, the real question is, with so many bad drivers on the road, why would we want them in the air? Most believe it would take a pilot’s license, and some serious defensive driving skills.